Music is a central part of the life of St. John's. All classes have weekly music lessons with Mrs George, our specialist music teacher and from Reception children are encouraged to participate and perform with confidence and enjoyment. Music lessons in the early stages involve singing, games and the use of puppets. Older children explore in depth a range of musical concepts including pitch-matching, phrasing, rhythm and pulse, tempo and dynamics. In Year 5 each child has the opportunity to try out a musical instrument for a term, rotating between a string instrument, a woodwind instrument and a brass instrument with specialist musicians. This gives every child the experience of playing three different orchestral instruments during the year with the option of then specialising further. Singing is a particular strength and it is very special when the whole school sings together. Visitors often describe being moved by hearing the children perform together. 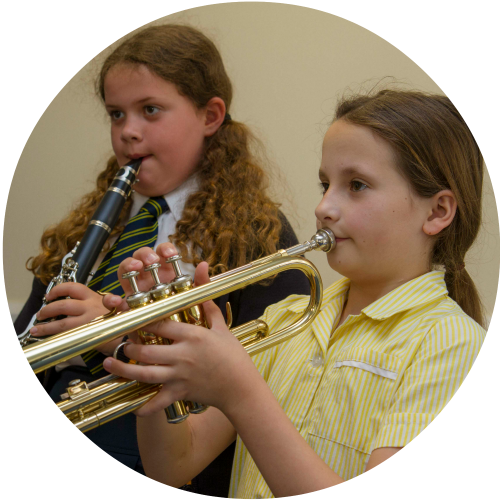 At St John's we have a very strong music department including professional musicians who provide individual, private lessons as well as music clubs which children can join. Individual lessons are available in a range of instruments including Violin, Viola, Flute, Clarinet, Saxophone, Cornet, Trumpet, French Horn, Tenor Tuba, Trombone, Classical Guitar, Piano, Drums, and Singing. The school has a collection of musical instruments which are available to hire while children are beginning lessons. If you have any questions or wish for your child attend please contact the school office to complete a form or email Mrs George at jgeorge@st-johns.croydon.sch.uk. Performance is an important aspect of the music curriculum. Children have the opportunity to perform in a number of different ways including as part of their class or the school choir or when playing an instrument. These may take the form of Concerts, Recitals, Church Services, Collective Worship and Plays.